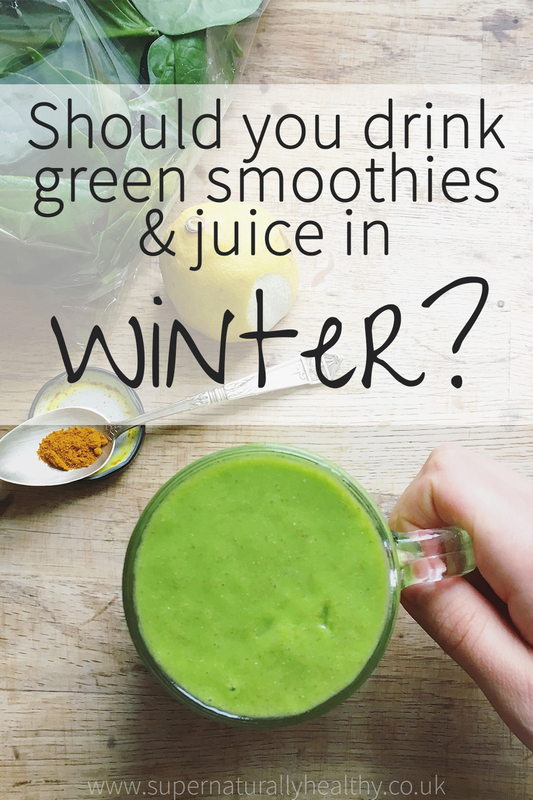 Should you drink green smoothies & juice in winter? Ok folks, it is now officially winter time. Cold nights, dark mornings, the joy of crunchy/icy leaves when walking and of course the endless excuse to drink hot chocolate and whiskey…or maybe that is just me?! But during this time of year, I often get asked whether or not people should carry on with their green smoothie habit? Is it bad for them and ‘too cold’ for the body to handle during this time of year? Plus how do you make previously ice-cold smoothies more appealing on cold dark winter mornings? So I am going to share my top tips for staying, or becoming, one green (glowing) smoothie goddess in the winter months. Honestly adding a green smoothie to your day is one of the simplest ways to boost your overall health. 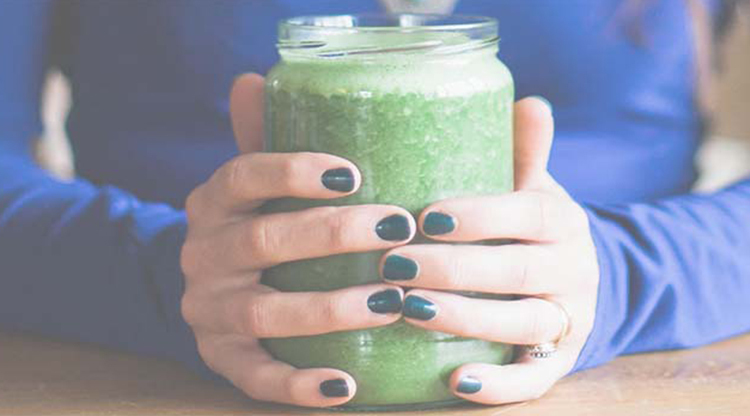 They are filling, energizing and simple to make and every week I get people emailing me to say the difference they feel after completing my 10-Day Green Smoothie Challenge – the green stuff is powerful! So to the question at hand – should you drink them in winter? Well, the simple answer is – yes! I mean in winter your immune system needs even more support and love and I don’t know about you but energy is something I need all year round. I know some people lose their craving for them in winter and this makes sense so obviously never force yourself to drink them. But the idea that they are ‘too cold’ for the body (a more ayurvedic and macrobiotic approach) does hold some validity but has no clinical evidence to back it up so if your body is still loving them then by gum – keep drinking them! BUT if you are finding it a struggle to get excited about smoothie in these winter months here is how to ‘winter-proof’ your green smoothies . 1. Say no to ice. If you use frozen spinach or fruit then when blending add a few tbsp of boiling water to ensure it is not ice-cold. I don’t enjoy ice-cold smoothies all the time so I often do this trick to make it room temperature so less jarring on the body when it gets colder. I LOVE turmeric! I have it everyday and it is powerful. 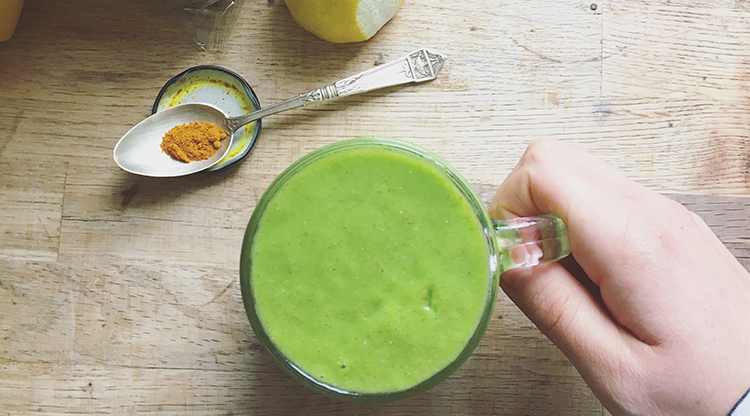 Adding 1/4 tsp to you smoothies is another way to add a little wintry spicey goodness. I have to say most days I have chocolate green smoothies but even more so in winter. In summer months I may have more raspberry or strawberry ones but in winter/life it’s all about the chocolate . I mainly use 1-2 medjool dates to sweetener and then add about tbsp of organic cocoa. At this time of year it is easy to just ditch being health due to the abundance of mince pies and chocolate lying around but that misses the point. Through the festive and winter season I always make sure I get a green smoothie in…as well as mince pies. Really want something warm in the morning? Then feel free to have your porridge and just have a little green smoothie on the side. OR switch your green smoothie from breakfast time to afternoon 3pm snack. So fear not green smoothies are for life not just for summer!!! I still tend to have one every day for breakfast and I notice that it really helps me to avoid colds and other bugs, plus it ensures getting a good dose of yummy vitamins every darn day. And if you are still a bit skeptical about green smoothies OR have tried making them but found they tasted like pond water then I have got you covered. My 10-day Green smoothie Challenge is the simplest and gentlest way to look after your body. Honestly the results that people get over 10 days after just adding in one small thing always blows my mind. More energy, better skin, happier, smilier 🙂 I’ve loved it! All the different flavours – sometimes on these things everything tastes the same or a bit bland but these were all so different in taste. Yummers. A feeling of fullness and calm. Meals have generally been skipped through the day and I usually get to the point where I’m trying to prepare whilst starving! So choices are random and made in a state of ‘franticness’. These 10 days have allowed me to be planned, but also feel fuller and so no more frantic, hungry, hangry, meals. My clothes are looser, but I don’t weigh as those numbers play with my mind. I feel ‘cleaner’ inside too….maybe the frequency volume of poo!